Spoiled Haul and some really awful pictures. - Polish Etc. Spoiled Haul and some really awful pictures. At the CVS pharmacy the other day I picked up four new Spoiled by Wet n Wild polishes. I love the bottle shape on these little guys, unique yet simple. 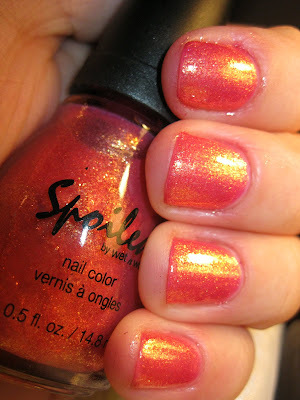 Spoiled polishes are inexpensive, and they have some amazing colors. The only complaint I have (which will be familier to you if you've picked up a bottle or read any reviews) is the brush. The brush on these polishes is thick, wide, coarse, and it has a strange angle to one side. This makes it extremely difficult to paint my nails with even though I have very broad nails. But the colors were too pretty to resist. I then proceeded to completely botch a few swatches. It was night and my camera wasn't doing any of these colors justice. From left to right: Shrimp on the Barbie, Plastic Flamingo, Jewelry Heist, Show me the Money, and Ants in my Pants. .
Shrimp on the Barbie is a light mauve toned pink with yellow/gold glass flecks. It's a very pretty color and the glass flecks make it unique in my collection. Plastic Flamingo. 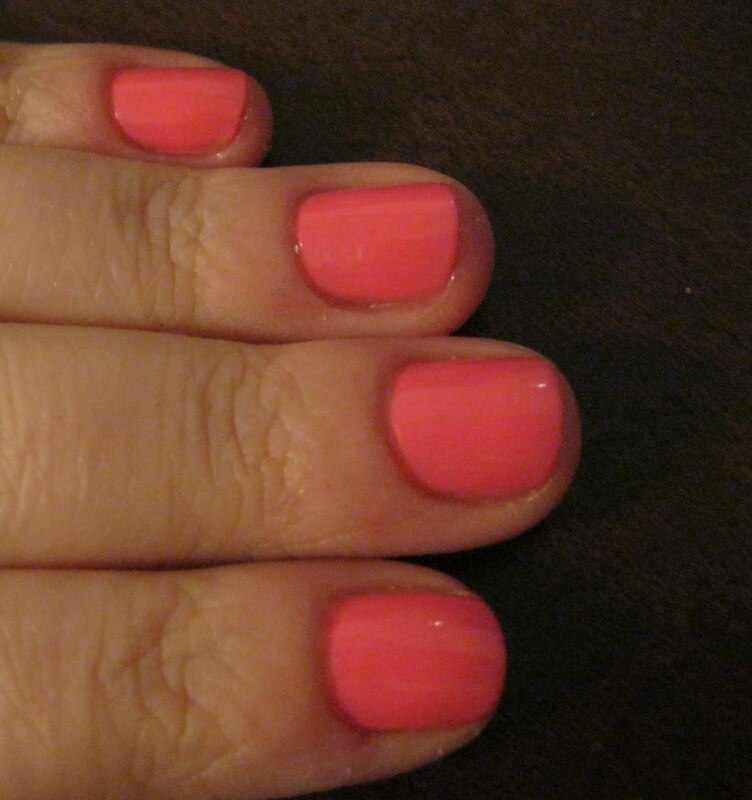 Oh yes, an impossible-to-photograph neon pink creme. This was two coats and applied wonderfully, for some reason the brush on this one was perfect, still wide but not so coarse. The true color is somewhere in between this over-exposed pink and the dark yet glow-y pink below. Jewelry Heist I only did a quick swatch with since I was lazy, the glitter was very hard to get out of the bottle (especially with the giant brush) and I sort of had to dab it on the nail (made more difficult with the wide awkward brush). 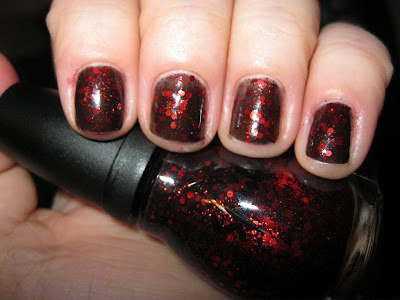 Two coats over OPI Sparrow me the Drama. In a clear base, Jewelry Heist has big hexagonal pink and gold glitter (the gold glitter pieces looks almost curved in the bottle and on the nail) as well as small black glitter and tiny square holographic glitter. Show me the money can be seen here: layered over top of China Glaze Paper Chasing. Last, and certainly not least is Ants in my Pants. Its a black jelly base with little red glitter and big hexagonal red glitter suspended in the glitter, truly beautiful! 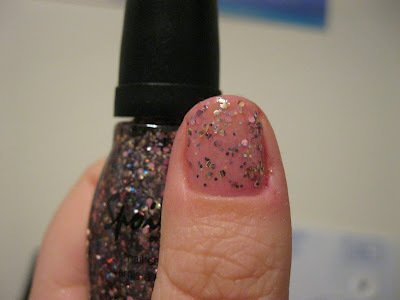 The glitter was a little bit hard to get onto the nail but built up beautifully with three coats. I'll have to re-do these swatches when I get a chance. How atrocious!